In addition to our comprehensive selection of new and classic comic books, we pride ourselves on providing our customers with an array of comic related memorabilia. 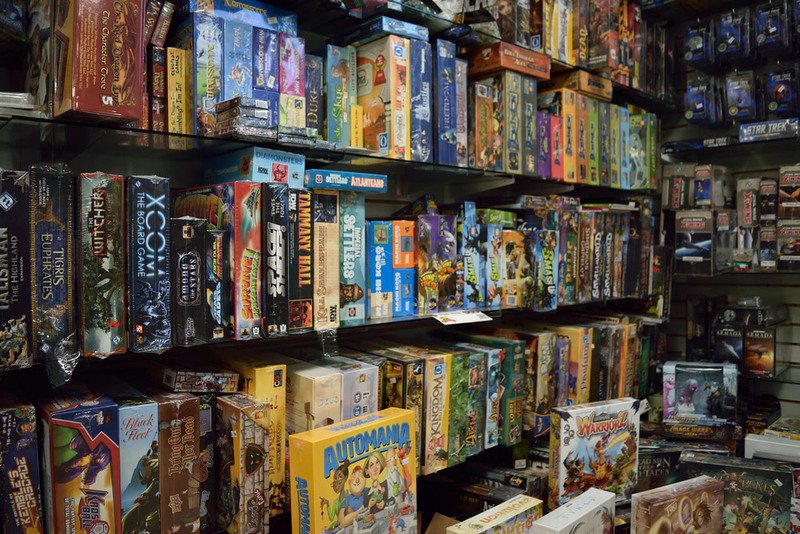 We have a large selection of graphic novels, role-playing games, trading cards, collectible card games, and miniatures. We look forward to seeing you in our store and hope that you can come visit us soon! New Comics arrive every week on Wednesday morning. We open at 9:00am and the week’s new issues are ready to be sold at that time. We have a gigantic array of graphic novels on display with new ones and restocks arriving weekly. The Comic Store offers a wide variety of Collectibles. We also have a full selection of Wiz Kids games and fun tournament play is usually held on Saturdays. The ever - growing ship miniature game of Star Wars and Star Trek from Wiz Kids and Fantasy Flight are prominently displayed. CCG such as the ever popular “Magic the Gathering”, VS (Marvel & DC), Vanguard, Pokeman and Yu-gi-oh are a constant seller at the Comic Store. We also have Role-Playing games such as Advanced Dungeons & Dragons, Cthulu, Star Wars and more.